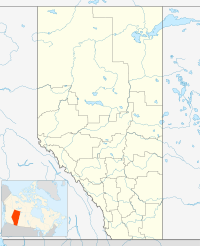 Green Court is a hamlet in central Alberta, Canada within Lac Ste. Anne County. It is located at the intersection of Highway 43 and Highway 18, approximately 127 kilometres (79 mi) northwest of Edmonton. The community takes its name from Greencourt, England. ^ Alberta Municipal Affairs (2010-04-01). "Specialized and Rural Municipalities and Their Communities" (PDF). Archived from the original (PDF) on 2012-02-29. Retrieved 2010-06-28. ^ Place-names of Alberta. Ottawa: Geographic Board of Canada. 1928. p. 59. This Central Alberta location article is a stub. You can help Wikipedia by expanding it.